Arigato event as through the eyes of the technical guy. And tea! Saturday was the final activity day and the Arigato Event day of Uda. For me, as I’m responsible for the technical area of World Campus Japan, the Arigato Event day looks quite different from the other participants’ day. It’s a very busy day and it can be stressful if I don’t have a good plan. I woke up about 7.30 and started working on the slideshow that I had created the day prior. The slideshow is an integral part of the Arigato Event where we show a collage of photos and videos from our stay with the host families, and for many it’s the highlight of the event. As such, I take the job of creating it very seriously. However, due to a lot of work and lack of time lately, I had to finish the slideshow on the same day as the event, which made my schedule very tight. After eating breakfast and washing myself, my host mother drove me to the Shinkou center, where we would spend most of the day. In the morning I was informed that I had to hold a presentation about World Campus Norway to the ten-or-so students that came from Nara prefectural university to visit us that day. That meant less time for me to make the slideshow, so I had to take every opportunity I could during the morning to work on it. Our first activity of the day was a tea ceremony experience. 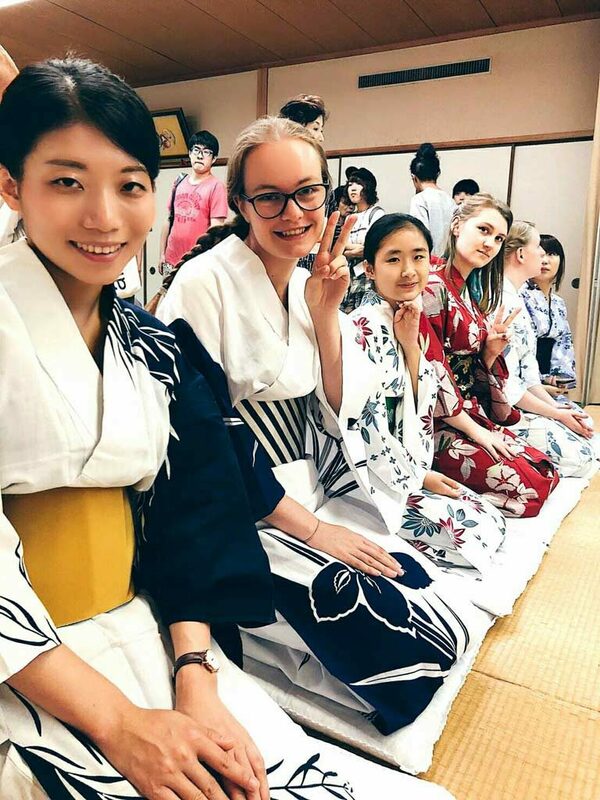 We all got to dress up in a Japanese yukata, a lighter summer version of kimono. While there are a lot of different customs to follow during a tea ceremony, our teacher was very casual and wanted us to enjoy the experience of drinking Japanese matcha tea (green tea,) so we only learned some basics. When drinking, we had to turn our cup three times such that the front was facing away from us, and then we had to turn it back before placing it in front of us so the front was facing ourselves. We also tried to sit in the seiza position, which can be very painful if done for a long time, but looks very beautiful. Next up was lunch. We walked to a nearby facility with the newly arrived university students from Nara. This day was extremely hot, reaching 35 degrees celsius, which is typical of Japanese summer. At the facility we had a buffet style lunch, made by some very kind local ladies. We enjoyed the delicious local food, including rice, cooked bamboo, fried chicken and eggplant, among other things, while talking with the Japanese students. Having had lunch, we returned to our original location where Juuso and I held a presentation and led a discussion with the Japanese students, while the other participants were doing team building activities. Juuso is in charge of World Campus Finland, while I’m a local staff of World Campus Norway. The students seemed very interested, and it made me happy to see that we could spread the word of World Campus to other people. Finally, it was time for final practice for the Arigatou Event before the real thing. I had to finish the slideshow first, and then I had to test the sound and video system of the facility, while the others were practicing. Trying to figure out how this ancient system works, mainly made for playing CDs and cassettes(! ), while the others are practicing and expecting me to participate and support them with music while not being in their way, is one of the hardest part of my job. I kept my cool and had to accept working with a very old projector for displaying our videos, and we eventually managed to do a full rundown of the event using the outdated sound system. It was time for the event. The event went exceptionally well. As expected of the second city, the other participants knew their dances and other parts very well, with only minor hiccups. The slideshow was well received, which made me very happy. When people laugh and enjoy my work, I’m very glad for all the effort I put in it. In the very end, after our performance, I was suddenly asked to play a cassette with some music over the sound system, because a local student was going to dance. I had not prepared for that, and it took me a few minutes to figure out how to do it, which caused a small delay. That’s a typical part of my job, but I have managed to accept that I can’t always be perfect and that I have to improvise. Being content with the work of the day, I went home with my host family and enjoyed tempura and a beer with my host father. I went early to bed in anticipation of the next day, which would be the last day of Uda, the host family day.